The United States has condemned the abduction by the Islamic State terrorist group of dozens of Assyrian Christians in Syria and demanded their immediate release. It was the first mass kidnapping of Christians in the war-torn country, although tens of thousands have already been driven from their homes by the jihadist Islamic State in its campaign of religious cleansing in both Iraq and Syria. The abduction of at least 90 Christians appeared to be in retaliation for a major Kurdish offensive aimed at recapturing nearby villages, the Syrian Observatory for Human Rights said Tuesday. "ISIL's latest targeting of a religious minority is only further testament to its brutal and inhumane treatment of all those who disagree with its divisive goals and toxic beliefs," US State Department spokeswoman Jen Psaki said, using another acronym for Islamic State. "ISIL continues to exact its evil upon innocents of all faiths, and the majority of its victims have been Muslims," she added in a statement. She added: "To bring an end to these daily horrors, we remain committed to leading the international coalition to degrade and defeat ISIL and to working towards a negotiated political solution that stops the bloodshed and secures a future of freedom, justice, and dignity for all Syrians." The mass-kidnapping of Christians in Syria follows the horrific mass-execution of 21 Coptic Christians in Libya earlier this month. 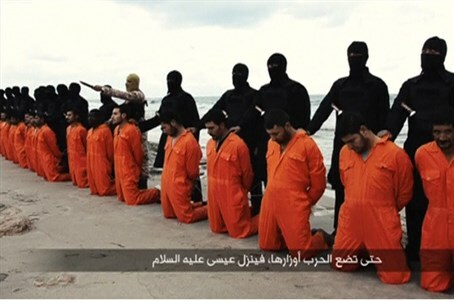 The men, who were Egyptian nationals, were murdered together in a carefully-staged performance that was recorded and distributed by Islamic State, also known as ISIS, ten days ago. The Obama administration, while condemning those murders as well, faced some criticism for failing to identify the victims as Christians targeted for their faith, instead just describing them as "Egyptians". As seen above, the State Department response in this case as well notably lacked any specific reference to the kidnap victims as Christians, only to "religious minorities" in general.